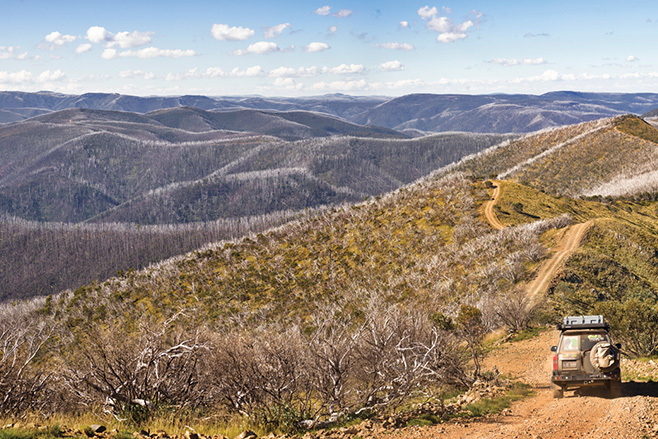 Tackle Hotham’s 4x4 tracks solo, or part of an organised tour such as Beyond Hotham. Either way, it’ll be an experience you’ll never forget! 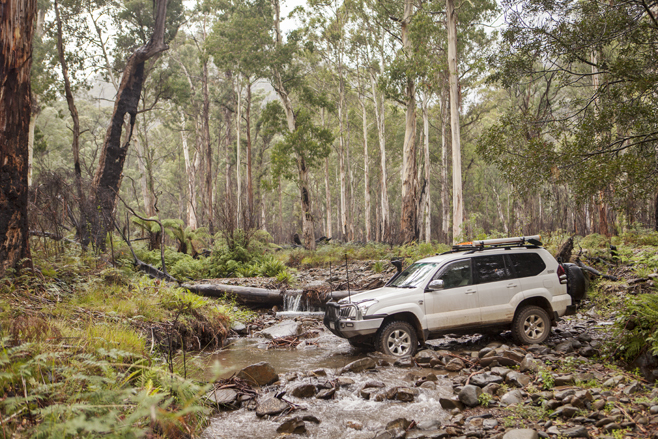 Some of Australia’s best 4x4 tracks are found near Mount Hotham, a four hour drive from Melbourne. Many of these tracks follow routes carved by early cattlemen and prospectors who opened up what was then uncharted territory. Mount Hotham Village is the ideal place from which to start exploring them. In the off season (most of the year for snow bunnies) Hotham provides good, cheap accommodation; so modern day explorers can spend the nights in comfort and get on the tracks when the sun’s out. If you’d prefer an organised tour of the region, Mount Hotham Resort Management run a 4x4 event called Beyond Hotham. Over 10 days in March and April each year the team offer professionally supervised trips for all levels of off-road driving experience and all manner of 4x4s. They teach newcomers the fundamentals of off-road driving before they hit the tracks and then help them polish those skills during one of the event's guided trips. Stock standard 4x4s are all you’ll need, and for someone who has just purchased their first 4x4, this can be a perfect way to acquire the experience necessary for your inaugural solo Aussie adventure. We joined Beyond Hotham in 2014 on their four night Other Side of Hotham trip; starting at Twins Jeep Track that runs off the main Great Alpine Road, a few kilometres south of Mount Hotham. After getting our tyres down to 25psi it was off the bitumen and into low range to cope with this track's rocky surface and moderate inclines and descents. 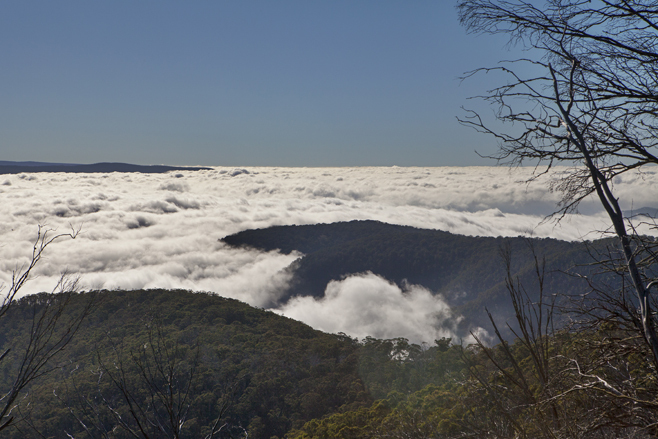 Cloud cover permitting, breathtaking views are to be had of deep eucalypt cloaked valleys as the track follows the ridgeline west to Mount Murray North Track. Here the convoy turned north and slowly descended some 2000 metres into the Buckland River Valley, a location infamous for its 1857 miners riot when racial intolerances boiled over and Chinese miners were driven off their claims. There's little sign of old mining activity these days and there are several inviting campgrounds along the Buckland River, like Beverage Station where we pitched our tents for a night under tall shady trees. From here several easy tracks – Scotchman Creek Track, Buffalo Range Track, Camp Creek Track, Cobbler Lake Abbeyard Road and Cobbler Lake Road – took the convoy through the Buffalo River Valley towards Lake Cobbler, our second camp. Originally an alpine wetland, Lake Cobbler was created in the mid-1900s by loggers damming one end. From Cobbler Lake Road there are good views of Victoria's highest waterfall, Dandongadale Falls, which plummets 255 metres off the Cobbler Plateau. From the lake, Cobbler Lake Track and Speculation Road descend 1000 metres to the floor of the King Valley. Some older maps contain a warning reference to The Staircase, a series of difficult rock ledges, which in the past brought many 4x4s plenty of problems. So many that the authorities bulldozed The Staircase several years ago and it’s now just another easy track. Speculation Road ends at Circuit Road – the two-wheel drive gravel road that encircles Mount Stirling. Travelling six kilometres north of this junction is Clear Hills Track and one of the High Country's most readily recognised landmarks: Craig’s Hut. Clearly visible behind the hut is Mount Cobbler, which is often referred to as Indian Head because its profile bears a striking similarity to that of the Native American Indian profile that appeared on some US coins in the early 1900s. Heading towards Mount Stirling the Clear Hills Track becomes a more serious four-wheel drive proposition as it climbs to meet Monument Track, a 3.5km dry-weather-only track that descends 1000 metres to Circuit Road. Bindaree Road, which runs off Circuit Track opposite Monument Track, heads down into the Howqua Valley and passes Bindaree Falls. It’s an easy five minute walk to the falls which have an unbroken drop of close to 100 metres. It’s also one of the few waterfalls you can stand behind. On reaching the valley floor and the Howqua River, Bluff Link Road gently climbs away from the river to the scenic, if a little rough, Bluff Track. This track passes Bluff Hut, Lovick Hut, Helicopter Spur and Picture Point – the latter has breathtaking views across the Howqua Valley toward Mount Buller. There are a number of bush campsites along Bluff Track but Lovick Hut, and its surrounding areas, offers the best amenities. After leaving Lovick Hut some sections of the track are very rocky and careful wheel placement is required. On a high ridge, Bluff Track meets King Billy Track which descends into the Macalister River Valley before climbing to Howitt Plains in the east. Near the top of that climb the road passes a scree – a 100-metre-wide jumble of boulders made from bluestone which stretches down the hillside and extends some eight kilometres into the earth's crust. The convoy spent the third night at Howitt Plains under the large snow gums that adjoin the car park at the start of a seven kilometre walking track to Mount Howitt. Camping is also available further down Howitt Plains Road at Howitt Hut, but it's a popular overnight spot for horse riding tours and other groups, so it can get quite busy. Zeka Spur Track, one of the few access roads into the delightful Wonnangatta Valley, also starts near Howitt Hut. Challenging in the wet, this track twists and winds as it drops a remarkable 3500 metres to the Wonnangatta River. It's not unusual to start the descent looking down over early mornings clouds that fill the valley like cotton wool. Starting at the western end of the valley, Wonnangatta Track takes visitors through a combination of open grassland and forest as it follows the river of the same name east and past the site of the old Wonnangatta Station homestead. Little now remains of the homestead apart from its foundations, a nearby cemetery and a number of European trees. A grove of deciduous trees near the homestead, that have remarkably survived an onslaught of bushfires, make for a shady camping spot in summer – in autumn they litter the ground with golden leaves. Herne Spur Track climbs steeply out of the Wonnangatta Valley at its easternmost point to meet Cynthia Range Track; which follows the ridgeline south to Eaglevale Track. This track descends to meet Wonnangatta Road and, a little way from this junction, Harry’s Hut. The present owners have faithfully restored the hut to how it would have appeared in the late 1800s; right down to the timber walls lined with newspapers of the day to keep out winter draughts. Original owner, Harry Smith, is known for alerting the authorities to the famous unsolved Wonnangatta Station murders of Barclay and Bamford in 1918. After a brief lesson in history the convoy returned to Wonnangatta Road and crossed Kingswell Bridge to reach Crooked River Road. This road goes over the Crooked River several times before reaching the site of the old gold mining township of Talbotville. These days Talbotville is nothing more than a grassy bend in the river, a far cry from the 1860s when gold was discovered nearby. In 1865 Talbotville boasted a butcher's shop, a bakery, blacksmiths, three general stores, a doctor, a chemist, a newsagency, a library, a brewery, a post office, a racecourse, and three licensed hotels. But by 1880 the gold rush was over and the town largely deserted. From Talbotville the Crooked River Track crosses the river some 23 times and continues on to Stonewall; the site of another old gold mining town. Along the track are many signs of past mining activity – fenced off mineshafts, the ruins of an old bakery and a steam engine and crusher. From Stonewall, Bulltown Spur Track climbs steeply back to McMillan Road; a gravel 2WD road to Dargo. Along McMillan Road is the site of Grant, which had a population of over 3000 at its peak in the 1860s. Though, very little remains these days. The Union Mine, which was discovered in the 1860s and in use until the turn of the century, is worth a visit. The mineshaft is driven horizontally into the hillside and it's possible to walk about 100 metres into the mine before the way becomes blocked by rocks. Also pay a visit to the cemetery on the main road. Continuing from Grant, McMillan Road meets the main Dargo High Plains Road. Heading north, this road passes an old cattlemen’s hut called Treasure’s Hut. Cattle are often seen wandering near the road as the Treasure family still operate leases in the area. Further along is Kings Spur Track which runs three kilometres out to The Escarpment; a good spot to camp or just take a break and enjoy the spectacular views across the valley to Mount Hotham Village. With the end of the trip's journey in sight across the valley, the last highlight on the agenda is Blue Rag. Accessed by a track six kilometres further along the main road, Blue Rag has views that are hard to beat. Though beware as it’s rated Double Black Diamond in difficulty (read really hard) and all but the last 200 metres of this track are a dawdle. Once at the trig point visitors are treated to 360-degree views across the ranges. Once back on the main Dargo to Hotham road it's only a short run to bitumen, Mount Hotham and the end of a few great days in the bush. Whether you are a seasoned 4WDer, or someone who's 4x4 has never seen anything but bitumen, a few days with the Beyond Hotham team will have you wondering why you haven't done this before. Mount Hotham Village is four hours north of Melbourne via the Hume Highway to Wangaratta. Then take the Great Alpine Road via Bright. Many High Country tracks are seasonally closed from June to November and the best time to travel are during the warmer months. Beyond Hotham is held mid-to-late March each year. Very affordable accommodation packages are arranged by Beyond Hotham at a number of ski lodges on a BYO food and linen basis. Hotel style accommodation is also available for those seeking a little more luxury. Campsites are available, but remember this is an alpine environment with the potential for sub-zero temperatures and snow at any time of the year. Fuel cannot be purchased at Mount Hotham and visitors should fill up at Bright or Harrietville (in colder weather it is recommended diesel vehicles use alpine fuel). Mount Hotham has a bar come general store which provides a range of common necessities and pub-style meals. Visitors staying in chalet-style accommodation need to prepare their own meals. Bright’s township has a supermarket and a full range of services. The condition and difficulty of High Country 4x4 varies widely. The tracks covered in this article were of an easy to medium grade that any standard 4x4 can handle. However, even modest rainfall can rapidly make conditions very difficult. A good quality Hema paper map and GPS is recommended when travelling in the High Country.